Master the Matrix – Official Blog of the Book "Master the Matrix"
Official Blog of the Book "Master the Matrix"
Matrix Tip of the Day! Are You In A Matrix? Influence Play of the Day! At Last! A Playbook On Cross-Functional Influence! Influence. It doesn’t happen on a schedule, and it can’t be calculated on a spreadsheet. It’s also becoming increasingly uncoupled from formal authority as represented on organizational charts. But in modern cross-functional organizations, influence is how decisions get made, how changes are implemented, how things get done. My latest book, The Cross-Functional Influence Playbook, breaks down the “art” of influence into a new model with practical strategies to build influence both over time and in the moment. The use of the word “playbook” is very intentional, as The Cross-Functional Influence Playbook is meant to be a resource that you turn to again and again. This book is best read actively rather than from the comfort of an armchair. Every opportunity for influence is unique. Just like a coach might rely more heavily on some plays than others depending on his opponent, you might not need all six influence ingredients for any given situation. But by keeping all these concepts in mind, you will learn what works best for your organization and see your influence grow over time. It might have been the scarf. It’s 5:00 am and I am packing up after a day of workshops in Zurich. Great questions, many of the same challenges with the matrix that I have heard across the globe. Yesterday’s theme seemed to be role clarity–specifically between satellite groups and “corporate.” We talked about it being a three-pronged solution: (1) get used to the ambiguity and lower your expectations on how much clarity there will ever be; (2) get clarity where you can (specially outline it in written form); (3) get good at have role clarity discussions (including assuming best intent; understanding the ‘why’ behind the issue and focusing on problem solving not defending turf). We seemed to be on the same page, these Europeans and I–the problems and approaches to the solutions seemed to make sense, to “fit.” I reflected on this as I decided to throw on a scarf as I walked out the hotel room door. Shooting for that effortless style that only European women can pull off. Today the scarf fell just right for me–effortless. My first Master the Matrix trip took me to Europe as well. I noticed several times–most distinctly walking into an airport lounge in Frankfurt–that to all those around me, I was quite obviously American. In a long line waiting to check in at the lounge, everyone before me got a “Guten Morgen” from the attendant. He took one look at me and said, “Good Morning.” Was it that obvious? Do I just scream “American”? Or worse yet, “American Tourist”? My scarf and I make our way to the airport. The taxi driver, security checkpoint and flight attendant all gave me a “Guten Morgen”. When I replied in kind, some launched into a conversation in German (until they saw the look on my face!). Could it be that on the last leg of this world tour I had gained global confidence? Could it be that not only have my matrix ideas proven themselves as globally relevant but I myself am oozing with this new found global perspective? Nah. I think it was the scarf. It’s a casino and probably not a favorite of the locals, but I loved it—a ship-shaped patio on top of two skyscrapers! What’s not to love? It was a Friday afternoon, but that didn’t stop people from asking questions and sharing observations. We ran way over and probably would still be chatting if not for the fact that I was meeting a friend for dinner and desperately needed a bathroom break! One of the themes in our conversations (especially the more private ones after the session) was conflict—the conflict that is inherent in the matrix, the need to get good at working through it and the vast cultural differences. “In Asian cultures, if there is a conflict, we don’t talk about it—ever.” One of the participants told me. “Does that mean you let it go?” I asked. “Of course not!” she responded. We stood in that break room a long time talking about how we would change this centuries-old culture of conflict avoidance and how we might bridge the western version of direct conflict resolution and the eastern indirect version. Mindset: We need to get comfortable with the fact that conflict is viewed very differently across cultures and that in multi-cultural organizations, we will need to give a little bit on our preferences to find the best way to tackle the inevitable conflicts that come up. Triage: We need to get good at knowing what conflicts to let go (or let play out) and which to tackle. Westerners don’t need to tackle everything head on, and those with more Eastern preferences avoid every conflict. Jujitsu: When we tackle it, we must do so with a lot of finesse and cultural sensitivity. For some, that means going in much, much softer than is natural; for others it means recognizing the discomfort and working through it. Zoom Out: In order to tackle conflict in a culturally and matrix-related way, we have to see beyond our own perspective. It will enhance our effectiveness in working through it and will help a solution present itself. Dotted line reporting relationships, project teams and cross-functional teams are the landscape of organizations today. The “matrix” organization, born out of a need for 1960s aerospace project teams to stay connected to projects as well as their “home base” engineering groups, is alive and well and sprouting up everywhere. Today even small, single-country enterprises and not-for-profit organizations are utilizing matrix frameworks to deliver increasingly complex products and solve increasingly complex problems. Matrix structures are intended to bring together disparate parts of the organization to create solutions, products and decisions that meet the needs of the enterprise and its customer base, rather than serving just one part of the organization. Matrix managers, those who are at the center of these intersections between global businesses and local resources, between technical expertise and business units and across multiple functions, are the front lines to making the potential of the intersections a reality. But they can feel more like labyrinths than intersections to those attempting to navigate them, especially when matrix structures pop up informally and aren’t managed in a purposeful way. When you have multiple bosses and/or a maze of resources (that you don’t have formal authority over) to work through to get things done, the game has changed, and traditional methods won’t necessarily bring you success. As leaders, we often fail matrix managers because we assume that working in these roles should be second-nature, and we don’t see the need to fill roles with people who have matrix-specific skills or provide the right support for them to succeed. In addition, we fail to anticipate the challenges inherent in matrix roles and the different approaches they require. 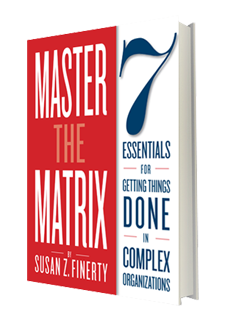 A new book by Susan Z. Finerty, Master the Matrix: 7 Essentials for Getting Things Done in Complex Organizations, aims to arm people in what she calls “matrix roles” with a new set of tools to tackle the unique set of problems they encounter regularly in their organizations. The book is based on her surveys and interviews of over 100 experienced matrix practitioners. It distills their years of insight working in matrix roles into straightforward approaches that anyone can learn and apply. I knew stop #3 on my global Master the Matrix tour would prove to be the most challenging: 400 Japanese colleagues in a large auditorium in Osaka, with Tokyo, Shanghai, and Beijing joining via videoconference; two interpreters in the room providing simultaneous translation. I decided I would throw a few Japanese words into my session, including the Japanese word for nervous…which I was…very. I was nervous about the content—would it align with their cultural beliefs? Would it be relevant? I was worried about my delivery–would I be able to slow down my rapid-fire style of speaking? This worry was reinforced when the gentleman next to me on the plane explained that it takes 40% more Japanese words to say what I am saying in English. Slowing down wasn’t necessary just to stay in sync, it was the only way the interpreters would be able to actually provide all the necessary words! I have worked in Japanese companies and with Japanese colleagues from the start of my career. But until this trip I didn’t truly appreciate how much it takes to make the Japanese and American working relationships effective. I talk about trust as key to making the matrix work. What I came to realize just how difficult it is to build trust globally. It’s not difficult just because of the distance and the virtual nature of our work, but because of language. How do we build trust when we are thousands of miles away and our language barriers keep us from having conversations at a deeper level? At the end of the session, this question of building trust across the global was the first one posed. I am not sure I have the full answer to this (or any new answers to it), but I think my view was reinforced by this experience. Technology can’t replace an in-person meeting and group meetings can’t replace a personal 1:1 conversation. In the end, regardless of culture, language or distance, trust is built by direct human interaction. Matrix organizational structures first became popular in the 1960s aerospace industry. Organizing people around projects, rather than into pyramids, was seen as a way to improve efficiency and productivity in complex ventures. Since then, matrix organizations have become widespread in commercial industry and even the nonprofit sector, to varying degrees of success. Nowadays, many companies that never use the word ‘matrix’ are structured around numerous informal matrices and matrixed teams. A new book by Susan Z. Finerty, Master the Matrix: 7 Essentials for Getting Things Done in Complex Organizations, aims to arm people in what she calls “matrix roles” with a new set of tools to tackle the unique set of problems they encounter regularly in their organizations. Finerty outlines four types of matrix roles. The formal project matrix is comprised of a project management office structure combined with a functional or business reporting structure. The cross‐functional team matrix brings in multiple disciplines/departments to address specific and often short‐term projects or issues. The reporting relationship matrix is most often seen as an outgrowth of globalization—it involves reporting to multiple bosses across functions, businesses or geographies. The customer hub matrix involves teams dedicated to meeting internal or external customer needs across a product line or business with a center of the hub coordinating resources. The complexity of organizational webs has grown rapidly, but most people working within a matrix, if they are even aware that they are in one, have little guidance on how to navigate it. A matrix represents a departure from the hierarchical structure of traditional organizations. But for the most part, when problems arise in matrix organizations, “traditional” solutions are the only tools applied to solve them. Last week marked the beginning the “Master the Matrix” global initiative! This first stop was a series of workshops for a client in Copenhagen. One group described this reality as matrix management “on steroids.” This is so true–you have to be so much more disciplined, diligent and focused in these global matrices. So it isn’t enough to challenge our assumptions about communication and other behaviors–those are symptoms. We have to challenge our assumptions of trust and realize when they are based on experience and evidence and when they are based on cultural bias. And realize that different cultures start at different levels of trust. In this case, the Danish have a high baseline of trust to start from, the US, fairly low. Role clarity can be a bit like alphabet soup–RACI, RACSI, DACI, the acronymns go on. In this case study, a matrix manager that was part of the research for the book walks us through the process and shares the tools from a role clarity effort that was part of a larger organizational realignment. The DACI matrix is a very useful framework to begin drilling down the process map, but it requires more detail, particularly to clarify who is to be consulted (C) and informed (I), in order to make sure that it is really implemented. The value of this case is that it explains how to detail these components, with valuable and tangible tools for practitioners that can be applied to a broad spectrum of reorganization initiatives. Fogacoop is a government-owned entity subordinate to the Ministry of Finance of the government of Colombia. Based in Bogotá, the organization is responsible for insuring cooperative companies–businesses that are owned and operated by their affiliates–and managing their support or liquidation if they run into financial problems. Fogacoop supervises over 200 organizations nationwide with a staff of approximately 50 employees. Every 2-4 years, the organization revisits their strategic planning to adjust to changes in government policies and ensure that all processes remain aligned as business priorities evolve. In 2011, Fogacoop began a major management process redesign to revise their strategy, processes, organizational structure, IT strategy and HR competency model. They needed a framework that would meet government mandates while streamlining performance matrices and information systems. It was also critical to overcome internal resistance to change, because without a top-down reorganization of roles with broad-based support from employees, the IT and HR initiatives would not thrive. By approaching this challenge with role clarity front-and-center in their strategy, Fogacoop was able to exceed their goals for the redesign. Their experience highlights how role clarity can serve as a linchpin for successful management restructuring and provide a strong foundation for implementing strategic initiatives. For those of you that have read the book, you know that I often refer to matrix roles being at “the intersection.” These roles are intended to bring together disparate parts of the organization and that can look (and feel!) like very much like a busy intersection (fender-benders and all).